Got a Business in Israel? Getting Listed is as easy as 1, 2, 3.. Simply select a Package, and get started! Get your business out there and listed for free every month ! For higher exposure ‘Get Featured!’ at the top of the listings for just ₪15 monthly! Or For maximum exposure and be on the homepage ₪35 monthly! Choose a Plan to get started.. If your city is not listed, tell us and we will add it! Create a detailed business listing page promoting your business in Israel. Add your Business contact details, Website address, Multiple images, social media accounts for maximum exposure! And when you submit your listing, your business gets pinpointed on our built-in map for all to see! 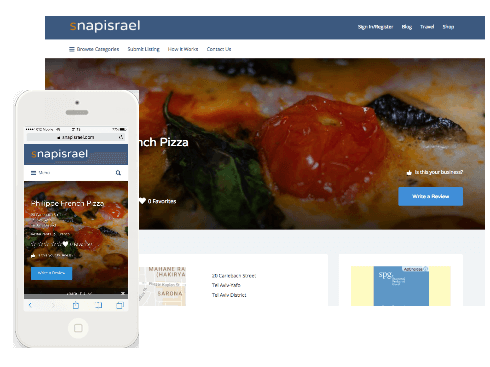 SnapIsrael.com provides the perfect platform to promote unique places to Eat, Drink, Sleep and Shop in Israel. 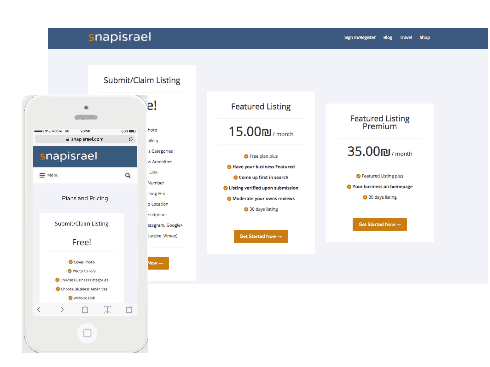 Getting Listed on SnapIsrael.com provides for a unique opportunity to put the spotlight on your business, attract more attention and get more exposure. With a beautifully optimized, search engine friendly, mobile ready site, easy to use navigation, secure payment processing and round the clock support team, getting listed on the site could be one of the best things you’ve ever done.. Here is a full complete business listing for you to check out. Click Here!